The charming old lady, Gloria Frances Stuart who portrayed the elder Rose DeWitt Bukater in the hit movie "Titanic", died in her sleep last Sunday, Sept. 26 2010 at her home in Los Angeles, California. It's hard to believe that Titanic was first released fifteen years ago, a movie that went on to become the most success of all time; until Avatar came along of course. And this week we get to live the romance, the drama and the tragedy all over again as Titanic 3D sails into cinemas. 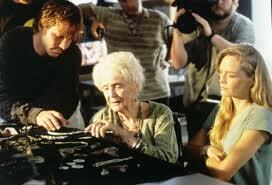 Gloria Stuart and Kate Winslet, both of whom play the character of Rose, were Oscar nominated for their work as the movie was told through the eyes of Stewart's older version of the character. But Stuart felt that before filming could begin she had to meet Winslet so she could learn her mannerisms and get to know the actress and how she saw the character. When Stuart picked up her Oscar nomination for the role she became the oldest person to be nominated for an Academy Award at the age of 87. For Winslet it was her second Oscar nomination, after being nominated for Sense and Sensibility, but it was her first Best actress nod.